I bought the new Bosch REAXX jobsite saw in July 2016. This is a great table saw for a woodworker who wants a high quality, powerful and accurate table saw but does not have the need or room for a larger cabinet , hybrid or contractor type table saw. If you work in a small basement shop or in your garage you will appreciate the small footprint and mobility of the saw. 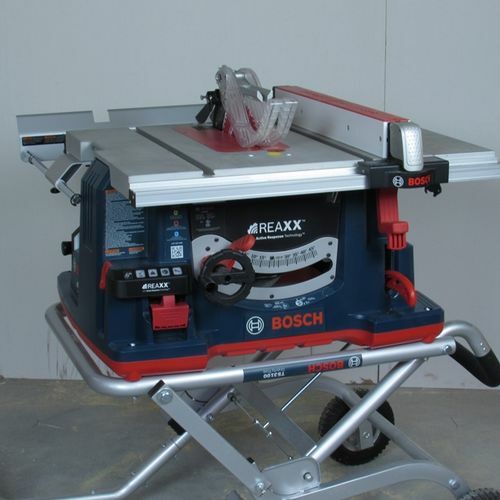 The REAXX table saw includes flesh sensing technology (Bosch calls it Active Response Technology). When the saw detects flesh contact (ie your finger) the Active Response Technology fires a replaceable cartridge and the UNDAMAGED blade drops below the table and spins safely to a stop. Even though I have been woodworking and using a table saw for over thirty years without incident, as a retired safety professional, I wanted a table saw with flesh sensing technology. No doubt the saw is significantly more expensive than a conventional table saw. To me, when considered over the life of the saw the extra cost represents inexpensive finger insurance. 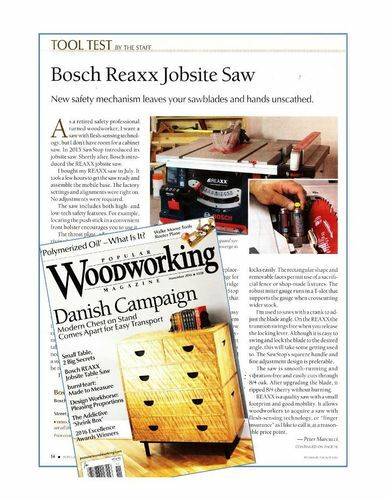 You can read more about my thoughts on the Bosch REAXX Jobsite saw in the Nov 2106 edition of Popular Woodworking magazine. Nice pictures but the link goes nowhere and the post to PWM says less than what’s here. I’m very interested in this saw so was hoping for more. Having the same problem here as in your blog post. I have redone the link to the video. Let me know if that works for you. Interesting…How much is the price compared to the Sawstop jobsite saw? I believe the sawstop and reaxx saws are priced very close to each other. Tom glad the link is working now. For at least 2 years now, on this forum, I’ve been arguing that this is the technology that makes sense—a lot more sense than SawStop’s. But I’m wondering, why didn’t you use the same hotdog, rather than a new one? Did you have a hot dog feed afterwards? I hope Bosch will license the technology to the entire table saw industry. Still have all my fingers, and have them crossed that Bosch will prevail against SawStop. No good reason why I didn’t use the same hot dog, other than I had two. The others were eaten during the premeeting BBQ. Here is a video where a man who has really puts his hand to the blade of both saws and found out some very interesting facts about how fast these contractor saws are at protecting your hands..
A must see if interested in either saw. O!!! and thanks for fixing the video so I would end up finding this. It may change your thinking about these saws a little. I really like the Bosch and know all they’re tools have a quality feel to them. I have the Dewalt contractors saw and love the fence system on it and have as you say no need for a full blown table saw for building my models, so my question is how good is the fence on this saw, does it track well, can’t help it but just love the fence on my Dewalt and would hate to lose that. The fence is solid and well built. Although adjustable it was set up correctly right out of the box. It has removable plastic faces and easily accepts hop made jigs. I read that Sawstop won the law suit on Paton infringement. Has anyone heard anymore on this. I like boshes idea more. That review video is really interesting. Bosch’s design has its advantages, but the SS looks safer. As they said, what folks don’t like is the sacrificial brake and blade, but that’s what makes it safer. Kudos to the guy willing to stick his own fingers in. Charles A : from a pure safety perspective the SawStop approach of actually stopping the blade then dropping it below the table addresses the hazard head on: ie: the spinning blade. I am amazed however, at how many people comment negatively about the damage to the blade. When I talk about the saw many comment negatively saying “Oh but I heard t destroys the blade”. I never thought that to be a big deal, when compared to the loss or serious damage to your hand, arm or finger. But it does seem to be a real detractor for people to accept the enhanced safety technology. When I watched the videos of the guy sticking his hand on the blade it struck home to me that these saws (Bosch or SawStop) won’t necessarily prevent you from getting cut, but they will prevent your from sustaining a catastrophic injury. Actually, being the owner of a thirty year old table saw, I was quite impressed with how the riving knife and guard system have been improved. They can be taken off the saw AND REINSTALLED without any tools. There is a higher likelihood that the guard will be put back on the saw after it was taken off. Also with the Bosch the push stick stores in a holster at the front of the saw. It is so easy to reach for it and then put it back when finished. Its always within easy reach so it gets used. A low tech safety improvement to be sure.